Discussion in 'Project Logs' started by mnpctech, 17 May 2018. Welcome! Thanks for checking out my tribute to Mad Max & his Interceptor build log. This is one of my Bucket list theme PC builds. My mother brought me to the premiere of The Road Warrior movie and I've been fan of this world ever since. This will be a modified desktop PC with liquid cooling. Inspired by visual elements of Max's Interceptor and the Mad Max World. ...and maybe Fury Road. There shall be rust and maybe even a Detonator attached to the PC? (lol). I'll be sharing highlights of it's progression stages, including video clip links as I move along in this thread. I have a basic idea of what PC hardware components will occupy this mad max inspired PC (motherboard, CPU, DDR, GPU, SSD, PSU) The case is an Enermax Equlilence they donated to me last year. If you've followed my past personal builds, I like to find good deals on hardware whenever possible I do plan to fabricate the liquid cooling lines from 361 marine grade stainless tubing. No idea what brand of CPU & GPU water blocks, radiators and fittings I'll use yet. The case is the Enermax Equilence I was given. It sorta looks like a Fractal Case, but without any of the well thought out features. I've modified the supercharger pulleys with larger plates to keep the belt from rolling off. I will be fabricating a new engine scoop to emulate Max's Scott Injector Scoop and painting everything dark grey. Fingers66, MLyons and Guest-56605 like this. Sweet idea. Love the little engine too. You want outa here? you talk to me ! Hey guys, glad to see you all! Thanks for the posts! I cut this opening in the Equilence bezel with a Jigsaw. Touch those tanks and *explosion sound*. Had opportunity to get back into the workshop yesterday and make some progress on my Mad Max / Road Warrior / Fury Road tribute PC build. I've decided to locate the V8 to the top panel. I'm going to mock up a 120mm slim radiator to see how it looks in front of the V8 engine and bezel. Hmm, on 2nd thought, maybe a 80mm radiator would be better scale? I still need to fabricate the proper diamond blower for the engine. The Enermax Equilence case lacks a vertical GPU mount, so I've modified the chassis for this compact ITX/MATX vertical GPU bracket, goo.gl/XGejK1 It's mounted on aluminum diamond plate, painted matte black. Here's a photo I found of the Falcon XB from the Fury Road movie before some stages I captured of my progress. The Car it self has quite a history ! i cant believe it's not a national treasure. REMEMBER THE NIGHT RIDERRRRRRR ! @kim, thanks for checking in and commenting!!!! @Defyant, I dont recall that, before we went live? That's location for the GPU with this do-it-yourself vertical mount. The final GPU will have water block. Next stage is modifying the top rear portion of the Enermax Equilence case to hold two water reservoirs to emulate the rear fuel tanks on the falcon XB. Do you recall the Red pull switch on Max's stick shift for his Supercharger? 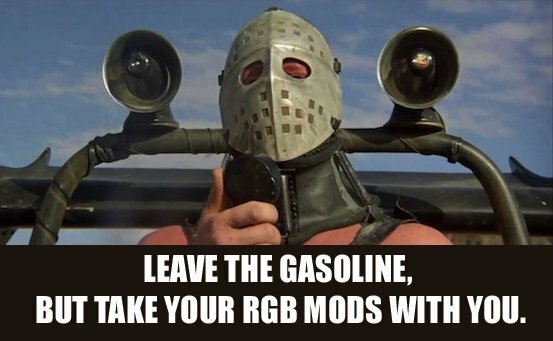 I thought it would be fun to somehow implement it into my Mad Max tribute build. The switch is used in commercial vehicles for controlling a two-speed axle assembly. I found it on Ebay as Cole Hersee part number 50036-BX. Our scale V8 sitting next to Black ICE GTX 80mm radiator. This morning I found 36mm thick 80mm radiator online shown below. Suppose Flex tube loop would be appropriate. Yeah, the larger Black Ice Nemesis GTX 80mm radiator may have won me over???? ?, instead of the scale appropriate generic radiator I was considering. It also allows options for different compression fittings, versus the welded inlet/outlet ports. I've mounted the classic aluminum framed Evercool 80mm fan and probably paint dark grey. Is your blower sagging?!!!!! MNPC Tech will have the bracket to fix that ! LOL ive never seen a "dummy blower" like that before wheres the pic from Bill?